Hello Glorious Redwoods! It has been too long! I can’t believe it’s been almost 2 years since I stayed at my Dad’s cabin in the Santa Cruz Mountains. It doesn’t feel like it’s been that long.. oh well. Chas and I really wanted to visit my family before we started our trip, so we made it a point to do so. It feels like a vacation within a vacation. 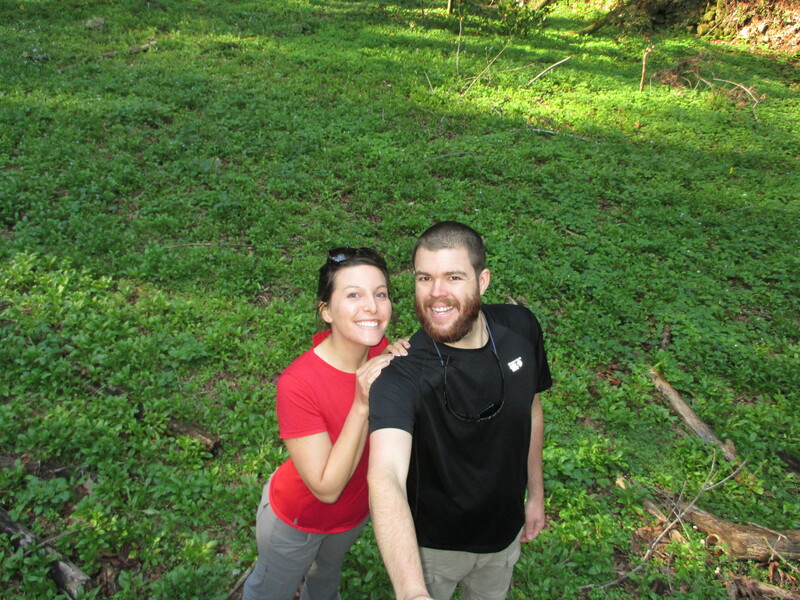 Lots of hiking, camping, and family time! 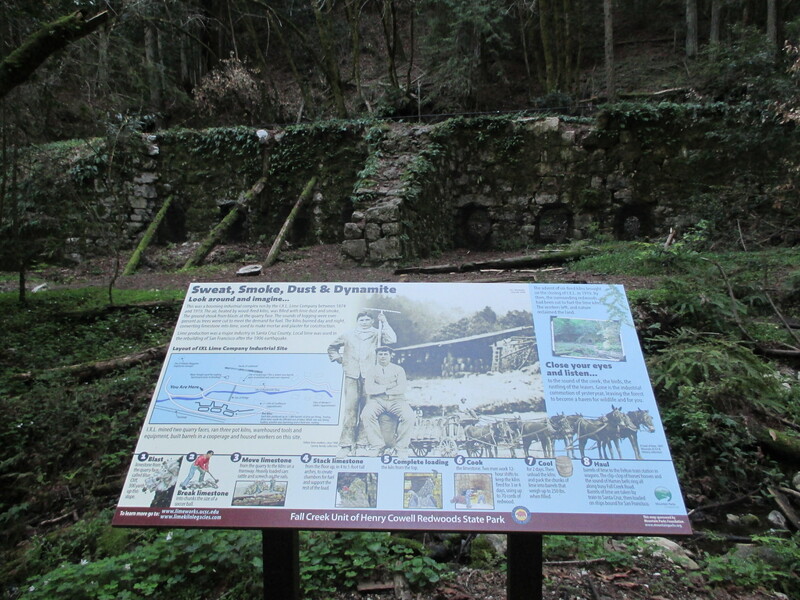 Chas and I took my younger brother to do a fun nature loop at Henry Cowell Redwoods. I’ve done this nature loop in the past, and I enjoyed it just as much now as I did then. It’s such a beautiful park. 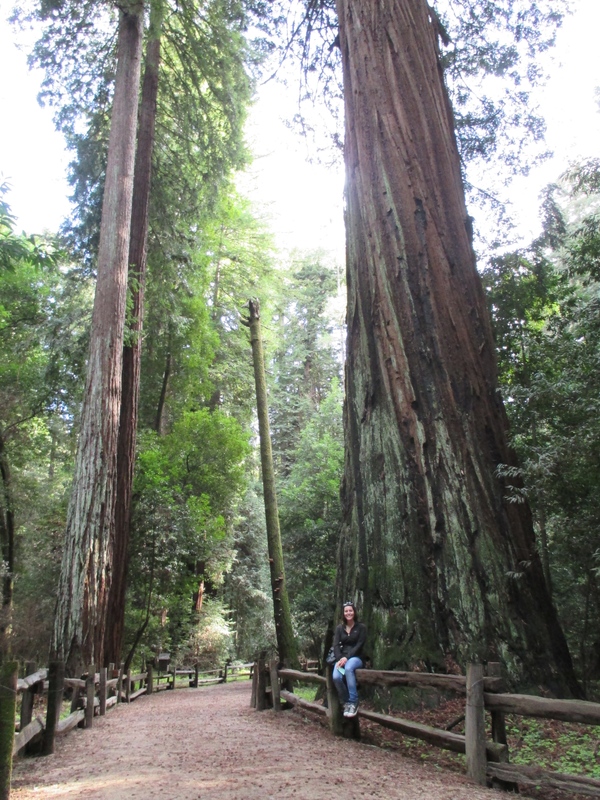 I love seeing the redwood trees, especially the great big ones! 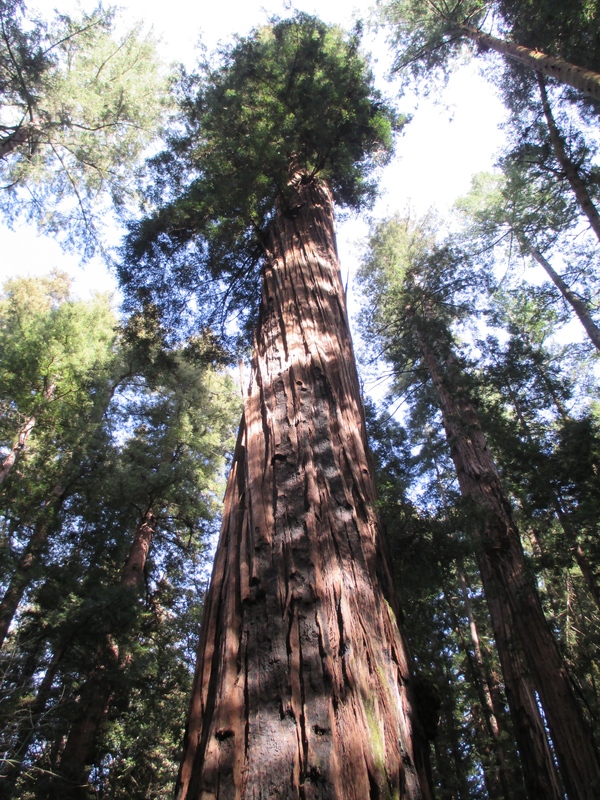 One of the trees is over 270 feet tall, and 17 feet across it’s trunk! 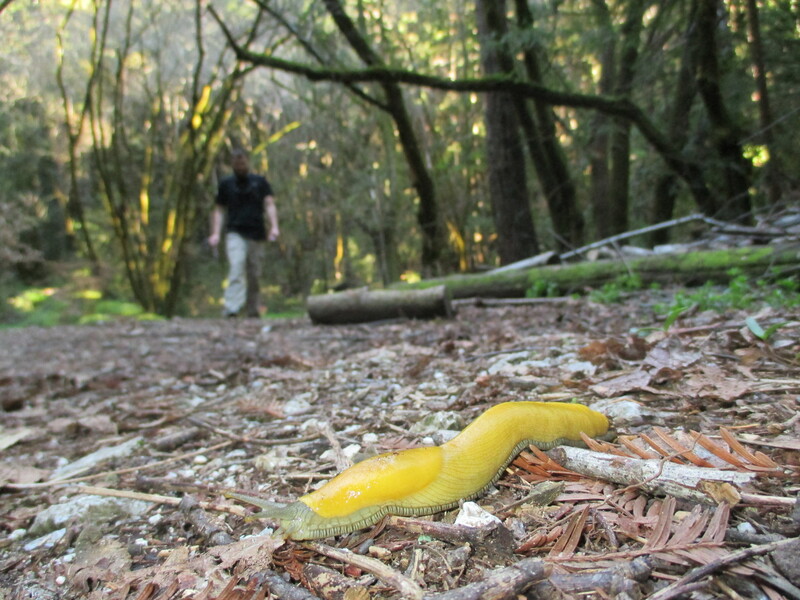 Looking for banana slugs within the sorrel ( the clover-looking plant around redwood trees) is always fun too. 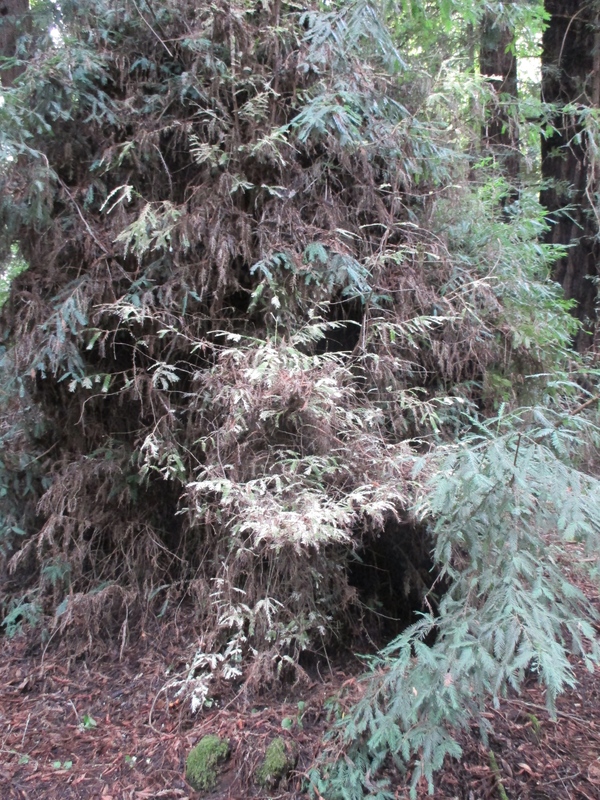 There is even an albino redwood tree! The albino tree lacks chlorophyl, which plants need to stay alive, but also gives the green-color to plants. This albino tree has attached it to another nearby tree and takes the nearby tree’s chlorophyl, allowing the albino tree to live. After the nature loop, we went over to Saturn Cafe in Santa Cruz for a delicious vegan “milkshake.” I got a chocolate shake, with cookie crumbs mixed in. The boys didn’t order a shake, but looked jealous when mine arrived. So I offered to share 🙂 Yum! Henry Cowell Redwoods has another part of the park, which we hiked a few days later. This was called the Fall Creek Unit, and is at the northern section. We made a loop of about 5 miles. 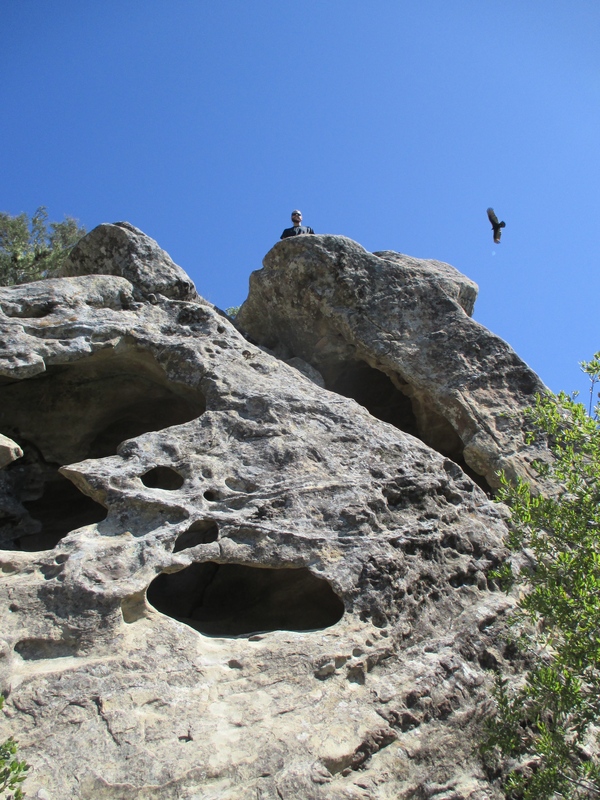 Along the hike we climbed the mountain ridge, explored old lime kilns, and traveled along a river. 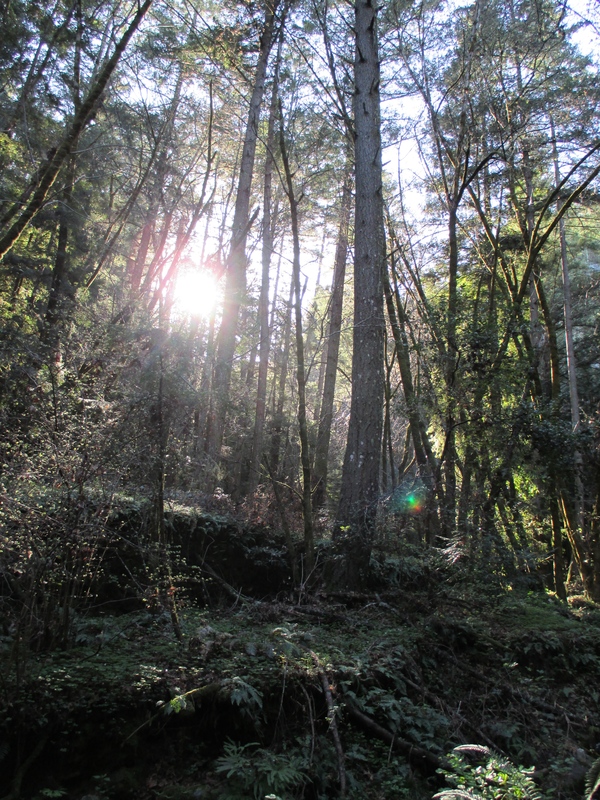 Hiking here in the redwood forest was a nice change from the San Diego desert climate. 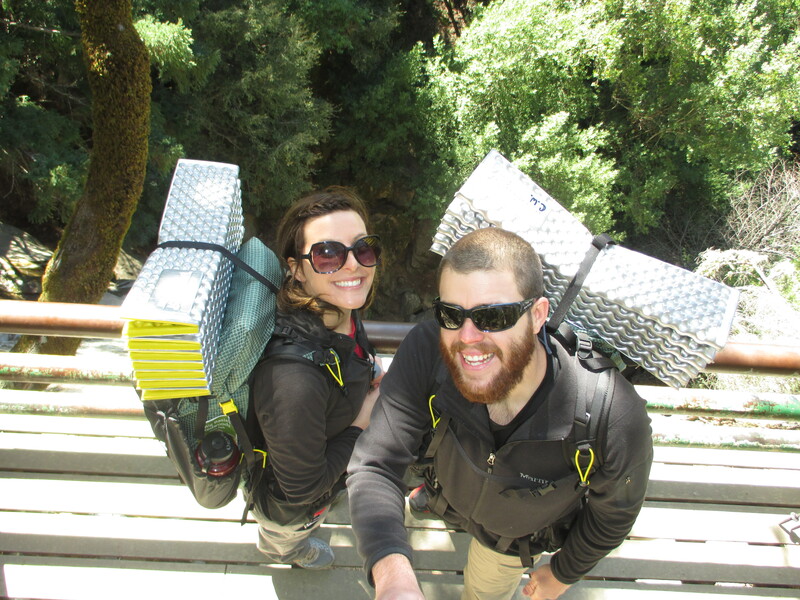 We really wanted to do a backpacking trip in the mountains, but all the backpacker camps in Big Basin were closed for the season. 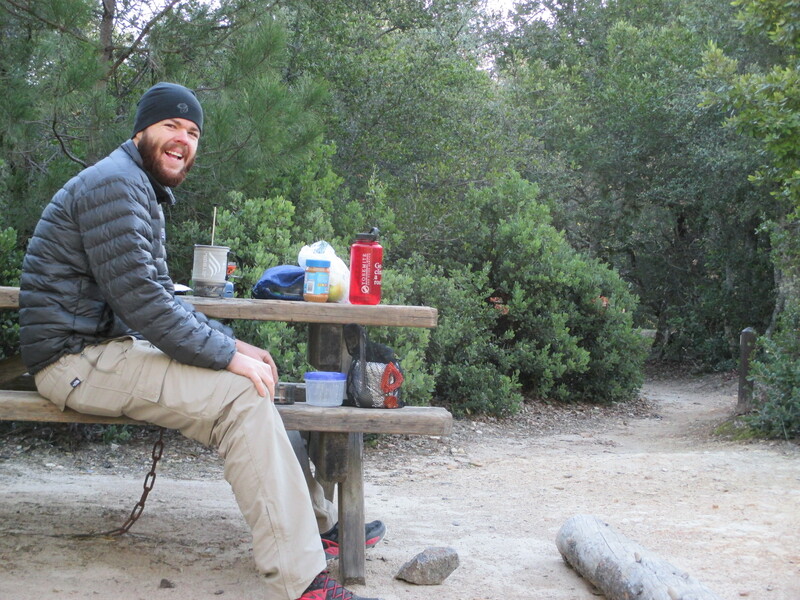 Only one was open, and it was the backpacker camp at Castle Rock State Park. The hike in was only a few miles, but we had the whole camp to ourselves! It was a little scary knowing there were no park rangers or other hikers. It was just Chas and I, along with all the signs warning us about predatory animals. All the sites were deep in the dense trees, and dark by early afternoon. We finally found a spot close to the edge of the mountain, where the trees opened up and the ground was almost sandy. The sun was shining, and gave us warmth even though it was cold and windy out. We knew this spot would be perfect for us! We had found a pile of firewood previous campers left on the other side of the campground, so we returned to gather it. We were stoked we could have a nice warm campfire that night. We made dinner after setting up our tent. 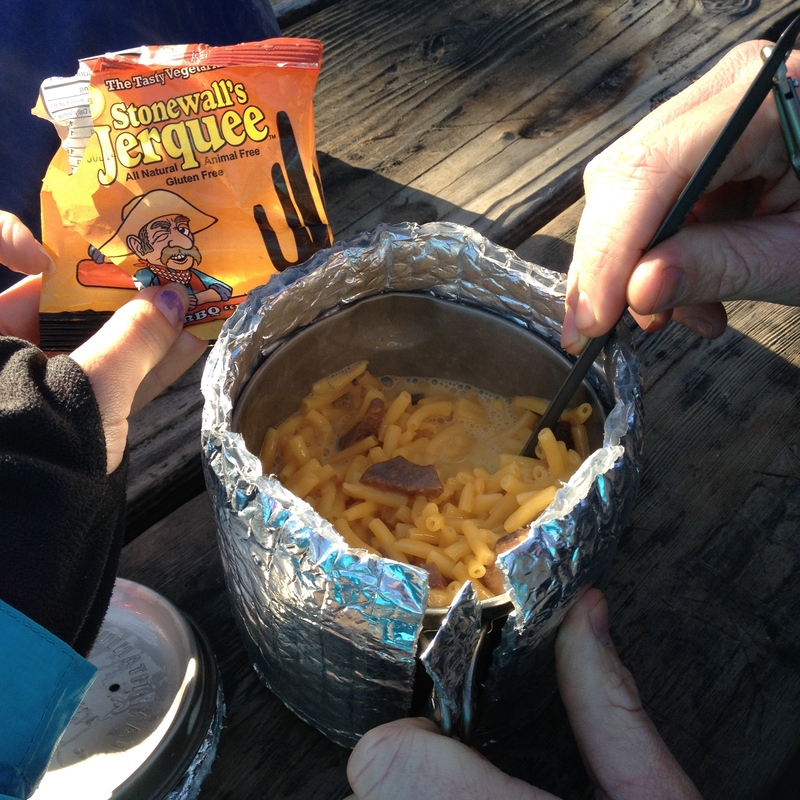 We tested the food we will be eating along the PCT. We made Kraft Macaroni & Cheese, and cut up some vegan “jerquee” to add. It had been over 15 years since I ate Kraft Mac & Cheese, and it was better than I remembered. Turn stove back on. Heat to a boil. Then turn off heat. Let sit another 10 minute. 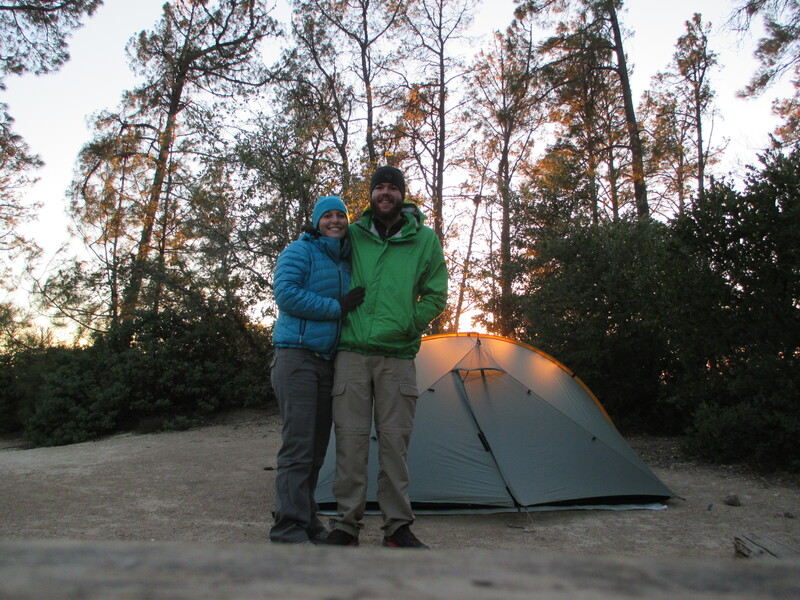 After dinner we watched the sunset, and got into our tent. The wind was roaring by now, but our tent held up like a champ! We were scared of moisture buildup inside the tent like it did in the desert, so this time we made sure the tent had ventilation. We laid in our bags, trying to sleep. But the wind was so loud we couldn’t right away. The wind wasn’t the only problem though. We woke up the next morning with sand in our tent, our eyes, and mouth. But hey, there was no condensation this time! Haha. Practice will make perfect.. I hope! 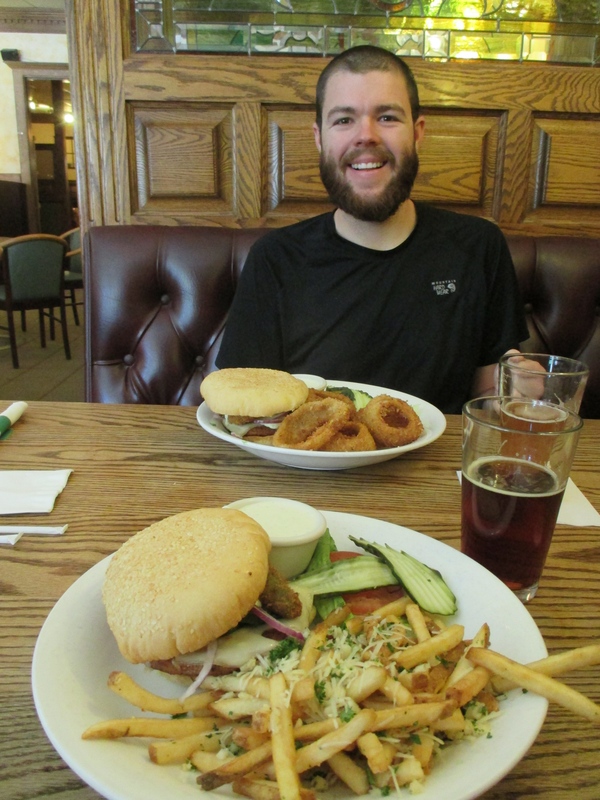 We hiked back out to the car, and indulged in beer and veggie burgers topped with avocado fries at Boulder Creek Brewery. It was a great way to end our little overnight trip- dirty, buzzed, and a full belly! 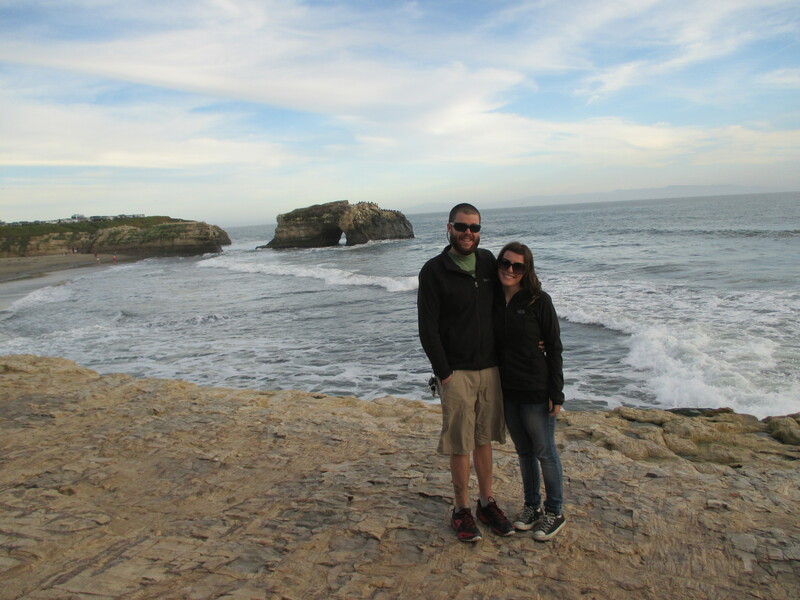 We had a great time up in Santa Cruz. Lots of hiking, and I got to hang out with my family almost every day of the week. We made homemade pizzas, barbecued, hung out by the pool, and enjoyed each other’s company. I’m really glad I got to spend time with my family and friends before our trip. I’m looking forward to having them meet us along the way!